This Christmas season make sure to continue to be a great recycler, thats one way to stay on Santa’s “nice” list! Properly dispose of packaging and decorations and think of alternatives to garbage to build new traditions that have the environment in mind. 1. Only recycle what we can recycle. That means only put the good stuff in the blue box, otherwise we would have to send it to landfill, and that breaks the cycle of recycling! 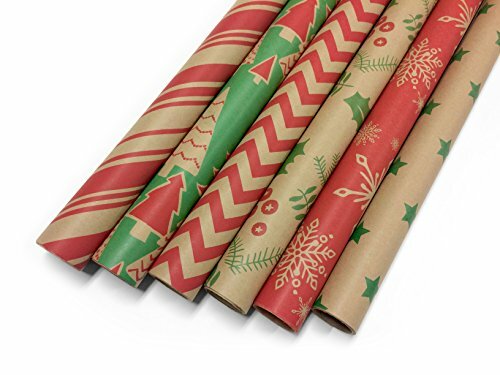 Please make sure to recycle all regular wrapping paper, paper gift bags (after removing the handles), and tissue paper in your “papers” blue box. 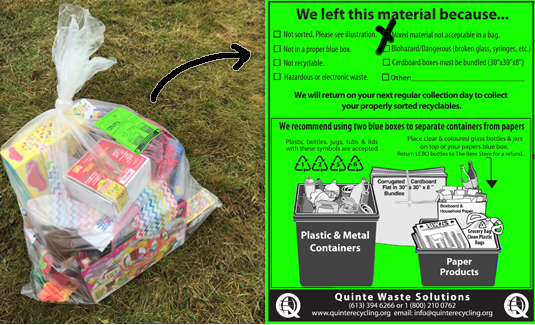 Remember, we will accept your recycling in bags ONLY if there is one material inside the bag. You can put all your papers in one and set that out to curb if you have more than a blue box’s worth. 2. Trash the rest – or, REUSE IT! 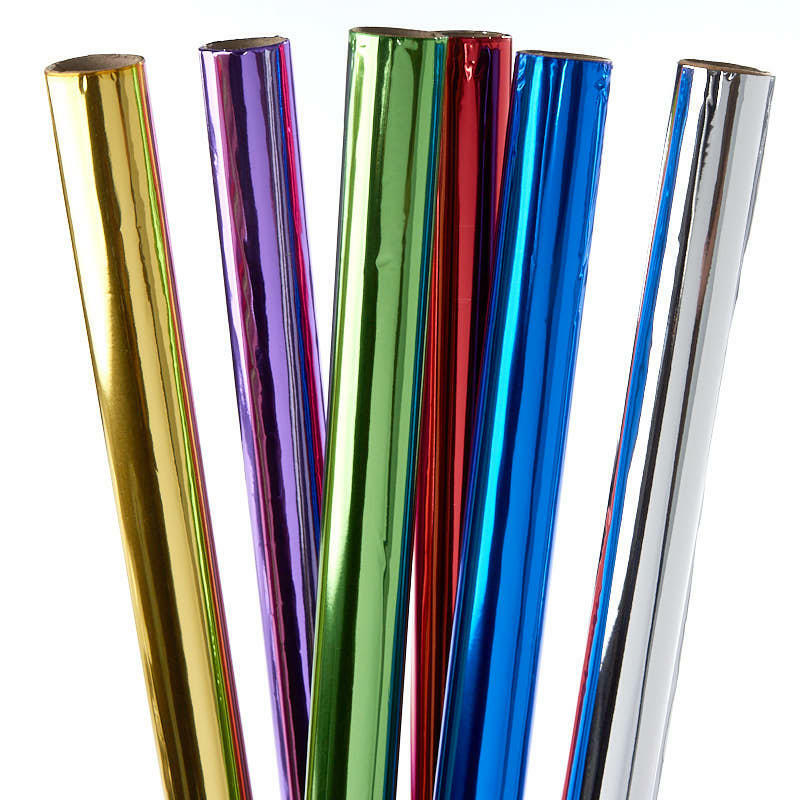 For things like shiny-foil wrapping paper, ribbons, and shiny gift bags, reuse them or put them in the trash. These items can’t be recycled through our program. No clear wrapping either. While we’re talking about shiny stuff, reminder that we do not accept chip bags or chocolate wrappers in our program, either. There are some interesting alternatives to traditional Christmas wrapping methods. For example, there is a Japanese method of wrapping gifts in fabric, find out more about that by clicking here. Another option (and one that is cost effective while being surprisingly beautiful) is using old newspapers or magazines to wrap gifts. 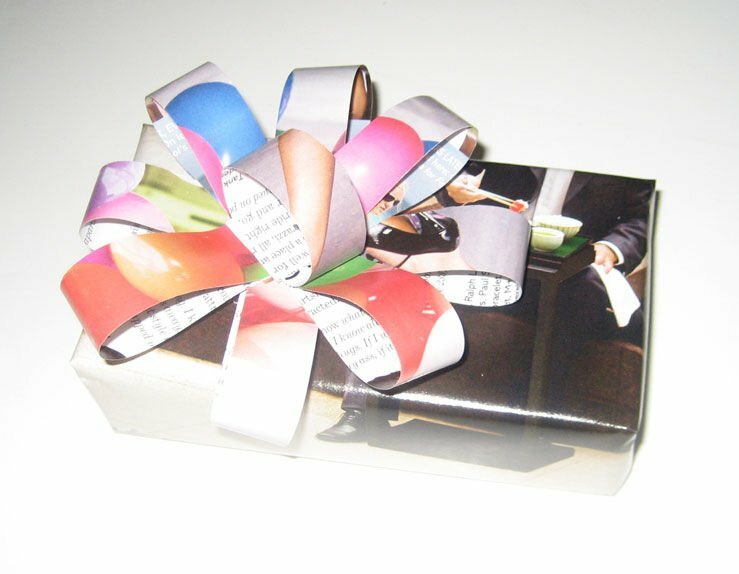 You can even make homemade bows with papers as well! Play around with old magazines for a pop of colour. 4. Pack your packaging. Before you recycle the boxboard, plastic, and all the little bits of a package, remember that all material has to be separated. Please remove the plastic from the cardboard before recycling, and take off all the little plastic attachments and twist ties that may have held the toy or item in place. Those little plastic bits and twist ties are garbage. 5. Have a designated sorter on Christmas morning. Shoving all wrapping paper, used up decorations, product packaging and the like into one bag and tossing it to curb on collection day just won’t work. That’s because our facility is designed for a two stream recycling system, and the material is sorting at the curb into the truck. Help out your truck driver and sort using two (or more) blue boxes. Kindly sort between papers and containers, and make sure all cardboard is folded into manageable sizes – we recommend 30” x 30” x 8” bundles. If you mix everything in one bag you might see it left behind with a green sticker on it. Those infamous green stickers are our driver’s way to communicate to you that something isn’t quite right with instructions on how to fix it. 6. Know your Holiday collection schedule. Recycling will not be collected on Christmas Day or New Year’s Day. If you have a Tuesday collection, your recycling will be collected on the previous Saturday instead of on the holiday. Collection will occur on SATURDAY, DECEMBER 22nd instead of December 25th, 2018. Collection will occur on SATURDAY, DECEMBER 29th instead of January 1st, 2019. Thank you for doing your part and have a Merry Christmas and a Happy New Year!